A queen excluder is a physical barrier with appertures of a size that prevents a queen from passing through. 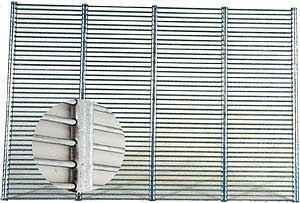 This is usually a screen constructed from a series of parallel wires or a flat sheet of metal or plastic with slots in. The queen is normally larger than workers, but so are drones and these are also unable to pass through a queen excluder. There have been attempts to make drone excluders, but to the best of my knowledge these are not available from the normal equipment suppliers. These have larger apertures that will allow queens to pass through. R.P. These are probably the most popular in the UK... They are the least expensive, however there are many drawbacks associated with them. The zinc and Zintec ones have a sharp burr that I believe in an impediment to easy bee access. The plastic ones do not seem to have a burr, but the punched holes have rough and granular edges and I believe this is as bad as the metal version as far as bee access is concerned. Another reason to dislike them is that they are laid directly on to the top bars (of bottom bee space hives) which causes a great deal of propolis and brace comb as well as causing a large disturbance to the colony as it is peeled off. The plastic version is also slippery, particularly if petroleum jelly is used on the box mating surfaces. A further factor that I dislike is the possibility of damage both buckling and tearing that makes a mockery of the title queen excluder. Having been so negative about the type when used as a separator between brood chamber and supers I can say that it is a useful material in the production of various gadgets. The dimensions of the 'hole' are 4.38 mm x 18.3 mm. In my opinion these are a vast improvement on the previous punched plastic excluders. There are several different types and colours and after lengthy trials they all seem to be standing up well. My only experience is with bottom bee space hives and I suggest that as with flat metal excluders they may not be very satisfactory when used on top bee space hives. Cleaning is simple and they don't get damaged when scraped with a hive tool. A solution of washing soda will remove wax and propolis. As with plastic or poly hives sterilisation can be done with bleach. R.P. As the wires are round and smoothly finished they allow easy passage of worker bees. The wires are stiff and are held strongly by the transverse perforated strips. The gap between wires is 4.22 mm. This type is the most expensive, but to my mind it represents the best value for money. This type is 'middle of the road' in both cost and utility it has round wires (2 mm dia) that are resistance welded to, thicker (4 mm dia), round cross members (tie rods). The wire to wire gap being 4.3 mm. This type is made in Germany and identical to queen excluder except in the spacing between the wires. There is also a flat wire type. I will try to find it for inclusion later. I am endebted to John Atkinson for supplying a sample of Neuner grid for me to measure. The inter wire gap on the sample I measured varies between 5.2 mm to 5.4 mm, but in the majority of places it is between 5.3 mm and 5.4 mm. The variation is mainly caused by wire thickness varying between 1.6 mm and 1.7 mm. I find this strange, as the Germans use manufacturing tolerances, at least, an order of magnitude smaller than that. Drone excluder can be made in UK, as right, by the spot welding method using the same wire pitch as for queen excluders, but using wires of less diameter to increase the transparency for queens and workers. A 5.3 mm spacing would mean wires of only 1 mm, which is probably too thin for reliability, but 1.4 mm stiff wires would give a 4.9 mm inter wire spacing that may be appropriate later when we have some bees 're sized' on 4.9 mm comb. The welded queen excluder, Neuner type and welded drone type are all drawn to the same scale so that comparisons can be made. Since the drone excluder text above was written, a project to manufacture a small batch of drone excluder was undertaken by myself in collusion with Brian Pedley, but the original idea of using his existing queen excluder jig was dropped when we found that demand was enough to manufacture a jig specially devoted to drone excluder. There is a whole suite of pages devoted to this project including full scale drawings. All of these are accessible by clicking on the dronex link. Although the queen is capable of 'going upstairs' they rarely do so and in this respect this type is of similar reliability to the perforated sheet types. I have heard that squares of fertilizer sack (heavy polythene), cut slightly smaller than the hive area, have been successfully used in this fashion. During the 1920s there were various types of queen excluder that had narrow panels of wire grid interspersed with wooden slats. The type that I have drawn is believed to have been manufactured by A.I. Root about 1920. Each individual grid was made by placing the wires in a mould and die casting the frame and perpendicular struts using a zinc based alloy. The grids were then assembled using longitudinally grooved wooden spacers with tenons on the ends and outer frame wooden parts that were grooved in the same manner as the spacers. They were available with bee space on both sides of the grid or with a single bee space to one side or with half a bee space each side. The gap was stated as 0.163" which is 4.14 mm.